*Full Program Terms, Conditions, and Eligibility Criteria apply. Patients with known or suspected hypersensitivity to salicylates or aminosalicylates or to any of the ingredients of DELZICOL. Renal impairment, including minimal change nephropathy, acute and chronic interstitial nephritis, and renal failure, has been reported with products such as DELZICOL that contain or are converted to mesalamine. Evaluate renal function prior to initiation of DELZICOL and periodically while on therapy. Evaluate the risks and benefits of using DELZICOL in patients with known renal dysfunction, a history of renal disease, or who are taking concomitant nephrotoxic drugs. 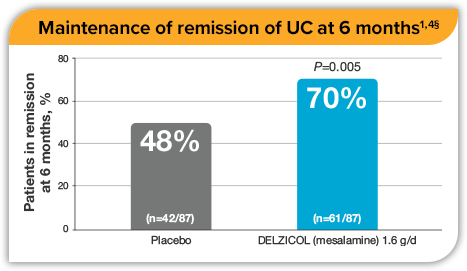 Mesalamine treatment has been associated with an acute intolerance syndrome that may be difficult to distinguish from an exacerbation of UC. Symptoms include cramping, abdominal pain, bloody diarrhea, and sometimes fever, headache, and rash. Observe patients closely for worsening of these symptoms while on treatment. If acute intolerance syndrome is suspected, promptly discontinue treatment with DELZICOL. Use caution when treating patients who are hypersensitive to sulfasalazine as they may have a similar reaction to DELZICOL. Mesalamine-induced hypersensitivity reactions may present as internal organ involvement, including myocarditis, pericarditis, nephritis, hepatitis, pneumonitis, and hematologic abnormalities. Evaluate patients immediately if signs or symptoms of a hypersensitivity reaction are present. Discontinue DELZICOL if an alternative etiology for the signs or symptoms cannot be established. Hepatic failure has been reported in patients with pre-existing liver disease who have been administered mesalamine. 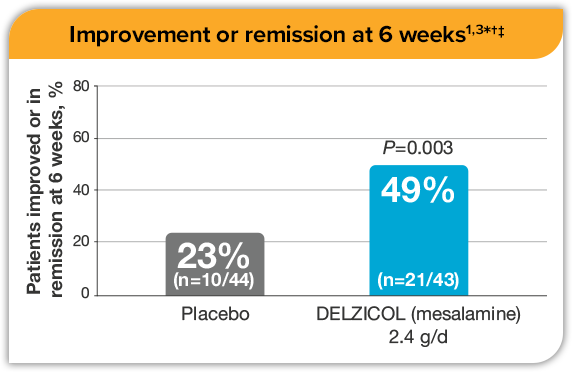 Evaluate the risks and benefits of using DELZICOL in patients with known liver impairment. The most common adverse reactions (incidence ≥ 5%) in adults were eructation, abdominal pain, constipation, dizziness, rhinitis, back pain, and rash. The most common adverse reactions (incidence ≥ 5%) in pediatric patients (5 to 17 years old) were nasopharyngitis, headache, abdominal pain, dizziness, sinusitis, rash, cough, diarrhea, fatigue, pyrexia, and increased lipase. The risk of nephrotoxicity may be increased with the concurrent use of mesalamine and known nephrotoxic agents, including NSAIDs. Monitor patients taking nephrotoxic drugs for changes in renal function and mesalamine-related adverse reactions. 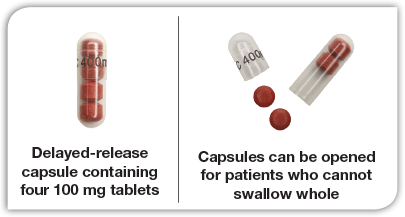 The risk for blood disorders may be increased with the concurrent use of mesalamine and azathioprine or 6-mercaptopurine. If concomitant use of DELZICOL and azathioprine or 6-mercaptopurine cannot be avoided, monitor blood tests, including complete blood cell counts and platelet counts. A higher incidence of blood dyscrasias (agranulocytosis, neutropenia, pancytopenia) has been reported in subjects receiving mesalamine who are 65 years or older compared to younger patients. Monitor complete blood cell counts and platelet counts in elderly patients during treatment with DELZICOL. 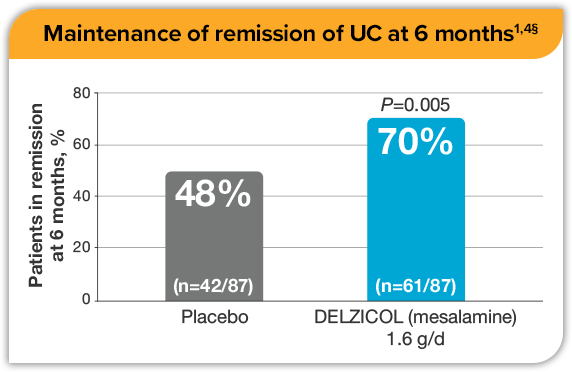 DELZICOL is indicated for the treatment of mildly to moderately active ulcerative colitis (UC) in patients 5 years of age and older and for the maintenance of remission of UC in adults. DELZICOL [package insert]. Irvine, CA: Allergan USA, Inc.; 2016. Sninsky CA, Cort DH, Shanahan F, et al. Oral mesalamine (Asacol) for mildly to moderately active ulcerative colitis: a multicenter study. Ann Intern Med. 1991;115(5):350-355. The Mesalamine Study Group. 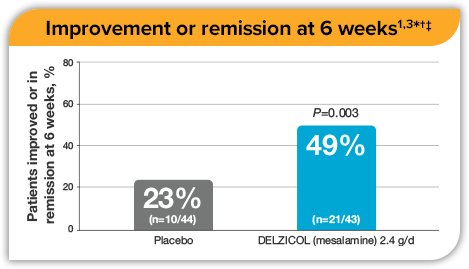 An oral preparation of mesalamine as long-term maintenance therapy for ulcerative colitis: a randomized, placebo-controlled trial. Ann Intern Med. 1996;124(2):204-211.